SUPREMACY OF STEEL VINYL DOUBLE GATE FOLD LP- Witness the grandeur as it was meant to be beheld! This masterpiece will look great up on your wall and in your collection. 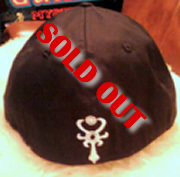 Only 525 pressed so they will sell out quick!! Hard card inserts also with the lyrics inside. blasted off to new levels of speed and power. Again the artwork by Marc Sasso is unmatched! Double Gatefold! A must for all collectors! This double gatefold beautiful double disc LP has amazing looking inserts and artwork. 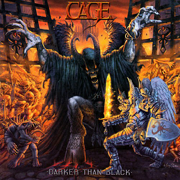 The album cover that was voted #4 all time power metal album covers is now on display as it was meant to be! Too many classic songs to list! GET THE 78 MINUTE EPIC HORROR CONCEPT STORY FEATURING IRON MAIDEN'S BLAZE BAYLEY AS THE MAIN CHARACTER ELLIOT WORTHINGTON. MANY ALBUM OF THE YEAR AWARDS FOR THIS EPIC SPEED THRASHER! Some fans swear by this one as the punishing BLOODSTEEL opens the fray leading you into additional tracks like THE BEAST OF BRAY ROAD, KING OF THE WASTELAND, and the HELL DESTROYER VS. METAL DEVIL epic. The 16 panel booklet is worth the price of admission in itself as never before has such an amazing metal art show been presented. See for yourself! Prepare for speed! 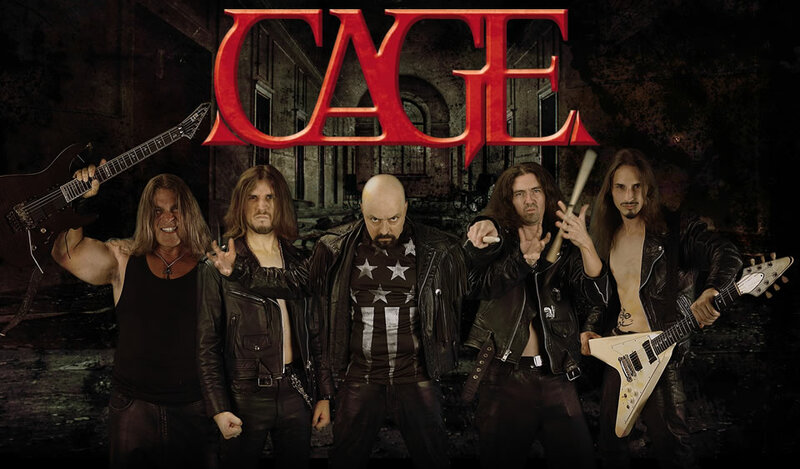 CAGE breaks the sound barrier with this thrash attack with soaring vocal absurdity like you love! Packed full of great songs like PLANET CRUSHER, SCARLET WITCH and BLACK RIVER FALLS. This one is currently Sean Peck’s favorite still! 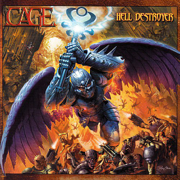 The ultimate concept album chronicling the ultimate battle between Heaven and Hell. Who wins You do as this cd received 12 album of the year awards! 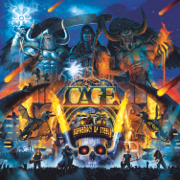 If you do not have this what the hell are you waiting for I AM THE KING, RISE OF THE BEAST, and METAL DEVIL among others rock the night and will have you fully engaged as the story unfolds into the ultimate metallic climax! Back in stock after 5 years! Is it their greatest cd ever? 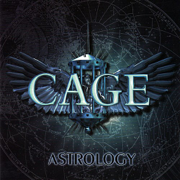 Only you can decide by picking up this re-branded version of CAGE's 3rd release complete with 3 bonus tracks and a revamped booklet. Don't miss classics like KILL THE DEVIL, CHUPACABRA, and EYES OF OBSIDIAN. 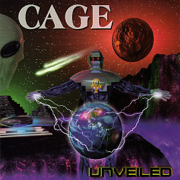 CAGE’s second release was an earth shaker of a cd garnering rave reviews around the world. 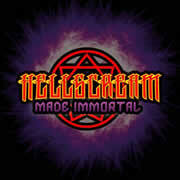 Packed full of songs including FINAL SOLUTION, THE TRIGGER EFFECT and the epic SOULS AND FLESH. The disc that started it all! This cd contains the CD Rom playable content as well as classics like SHOOT TO KILL, DANCING AROUND THE FIRE and BURRIED IN THE BOX. Make sure you have the cd that got them best new band of 1999 in the world famous ROCK HARD magazine. Do not judge this book by its cover! ANCIENT EVIL AUDIO BOOK Narrated by Sean Peck himself enjoy the story in all its glory while a lit candle flickers in your room as you listen. Download link will be emailed directly to your email address! A download link for the ebook file will be sent right away for you to view in your e reader. Includes illustrations! ANCIENT EVIL PAPER BACK BOOK 7.00 USD Illustrated and autographed, get the horrific inside details of the Ancient Evil saga ! 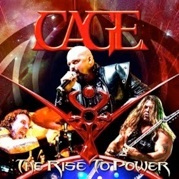 Sew it on your vest and show the world the American power Metal kings are represented! Comes in Red lettering or White. 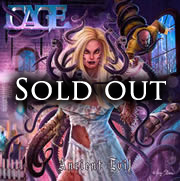 ANCIENT EVIL SHIRT 15.00 Front print only of the cover art limited supply going fast! Marc Sasso has painted this masterpiece of a beast of a shirt! Another 9 screen, vibrant image that will never fade like your love of steel! 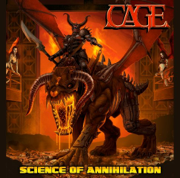 The fastest CAGE yet so show this SCIENCE OF ANNIHILATION shirt and let them seem you know your metal! 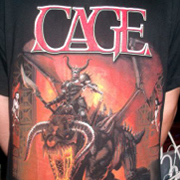 This 2 sided, 9 screen shirt is of the highest quality and features JUMBO PRINT technology for a huge image of the stunning SUPREMACY OF STEEL artwork and the band with the iconic CAGE-CROSS on the back. Represent! This vibrant 4 foot tall flag will look great on your wall! 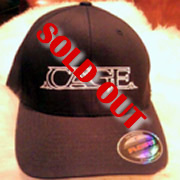 This form fitted hat comes in 2 sizes SM/MD and LG/XL. Embroidered in white they feel great on your head! HELLSCREAM, the new heavy / power metal musical project featuring guitarist David Garcia(Cage) and vocalist Norman Skinner (Skinner, ex-Imagika) have joined in an unholy metal alliance and are firing their cannons of destruction by releasing the band's earthshaking independent debut cd titled "Made Immortal".